Fantasy Football Running Back Start/Sit Rankings (Week 12) - Fantasy Football, Fantasy Football Rankings | Mac Bros.
1. 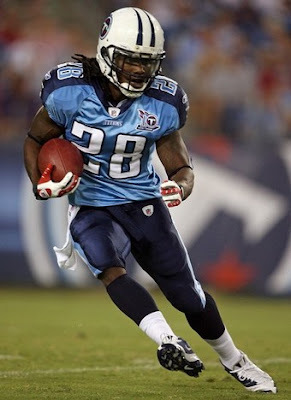 Chris Johnson (TEN) – At this point in the season, there is not a more desirable fantasy option in the NFL than Chris Johnson. He has proven to be virtually unstoppable of late and on the other side of that spectrum is an Arizona run defense that could not be playing worse at the moment. The Cardinals do rank an impressive 8th in the NFL against the run for the season, but that ranking is very deceiving when you consider that they have been absolutely torched by opposing RBs in their last 4 games. Johnson is an obvious must start for week 12. 5. Thomas Jones (NYJ) – He was not able to find the end zone in week 11 against a stout Patriots run defense on the road, but Jones was still impressive, topping the 100 yard mark for the 4th time in his last 5 contests. As for week 12, conditions are favorable for a very productive game against a struggling Carolina run defense. The Panthers gave up 3 TDs to Ricky Williams just last week, they rank a poor 26th in the NFL in run defense and there are only 5 teams in the NFL that give up more fantasy points to opposing RBs. Start Jones with confidence. 7. Ryan Grant (GB) – He was able to exceed the magical 100 total yard mark on Thanksgiving, but Grant’s performance was still a bit disappointing considering the opponent and the fact that he was unable to get into the end zone. 8. DeAngelo Williams (CAR) – He has not been able to find pay dirt in his last 2 contests, but Williams has put up top flight yardage totals in 6 consecutive games now. He should continue that trend with a decent enough match up in week 12 against a middle of the road Jets run defense. While there are no guarantees, Williams is also overdue to get back into the end zone this week as well. 10. Frank Gore (SF) – While Gore only touched the football 10 times in week 11, he made the most of those touches by totaling 68 yards and scoring a TD in the receiving game. Gore should get a dramatic boost in his workload this week against a mediocre Jacksonville run defense. Needless to say, we like his chances for a very solid game with this match up. 11. Ray Rice (BAL) – For obvious reasons, a week 12 match up against a top flight Pittsburgh run defense is not ideal. Fortunately, Rice is one of the few fantasy backs that is versatile enough to be productive against the Steelers. He should prove very useful in the passing game as usual and despite the difficult match up; it would not be wise to bench him given his solid track record of consistency throughout the season. 12. Joseph Addai (IND) – He has 5 TDs in his last 3 games and has now scored at least 1 TD in 80% of his games so far this season. Addai should continue that trend in week 12 against a mediocre Houston defense. Just 3 weeks ago, Addai had his best fantasy effort of the season against the Texans by totaling 112 yards and scoring 2 TDs against them. 13. Marion Barber (DAL) – He wasn’t able to find the end zone on Thanksgiving day against the Raiders, but Barber still managed to have a fairly successful day posting 102 all purpose yards. With Felix Jones starting to take on a more prominent role in an already pass heavy Cowboys offense, Barber’s fantasy value looks to be a bit shaky moving forward. 14. LaDainian Tomlinson (SD) – He isn’t blowing opposing defenses away like the vintage L.T., but he is starting to produce solid numbers on a consistent basis. Hopefully, he can continue that trend in week 12 against Kansas City. The match up is definitely favorable as the Chiefs rank just 27th in the NFL against the run and they give up the 7th most fantasy points in the NFL to opposing RBs. That said, Tomlinson’s numbers were fairly disappointing against the Chiefs in week 7, so don’t get your hopes up for a monster performance, although he should easily exceed his week 7 totals this time around. 15. Justin Forsett (SEA) – If Julius Jones should be cleared to play, Forsett would immediately drop to RB2 status at best. That being said, Jones was reported to still be experiencing a lot of pain as of Friday and we would be a bit surprised if Forsett was not the featured back on Sunday. If Forsett is lucky enough to take on a featured role in week 12, he should be in for a very productive afternoon against the always fantasy friendly Rams run defense. St. Louis ranks just 28th in the NFL against the run and they give up the 4th most fantasy points in the NFL to opposing RBs. Be sure to monitor the status of Julius Jones on Sunday to be on the safe side. 16. Brandon Jacobs (NYG) – Disappointing is not a strong enough word to describe Jacobs’ Thanksgiving performance. Everything seemed to be in place for a successful fantasy outing against a Denver run defense that had been struggling heading into this game. Unfortunately, it was not meant to be as the sluggish Jacobs only managed 57 total yards against the reinvigorated and swarming Broncos defense. 17. LeSean McCoy (PHI) – He has yet to explode with a monster fantasy performance this season, and while we believe the rookie back is capable of such a game, you probably can’t expect to see it this week against Washington. The Redskins do rank an unimpressive 25th in the NFL in terms of rushing yards allowed, but they are one of the stingier defenses around when it comes to giving up TDs on the ground having allowed just 5 all season. Regardless, McCoy has the potential to put up solid numbers this week and he easily qualifies as a RB2 with this match up. 19. Jamaal Charles (KC) – Due to the fact that he plays in a lackluster Kansas City offense, Charles is not given the credit he deserves as a fantasy option. The fact is that this guy has already proven to be a very capable fantasy option. He totaled 117 yards and a TD against Oakland in week 10 and his numbers were very respectable against a top flight Pittsburgh defense in week 11. In fact, we are very confident that he can get the job done against a shaky San Diego run defense in week 12 as he averaged 8.3 yards per carry against them back in week 7. Our only concern is that the Chiefs will abandon the running game if the Chargers jump out to a big lead. 20. Laurence Maroney (NE) - In spite of the concerns that go along with starting a New England RB in fantasy football, Maroney seems to have solidified himself as the Patriots go to back (for now) and the results have been very positive over the last few weeks. A week 12 match up against a Saints run defense that has struggled of late is also promising. That being said, New Orleans will be getting a couple of key members of their defense back from injury this week which could make things more difficult and Sammy Morris is also expected back from injury for the Patriots which could cut into Maroney's workload (although we doubt it will be much). Regardless, Maroney makes for a decent RB2 play this week.